Why do the fallen women in The Magdalen House refuge continue to die mysteriously? A devastating fire at Danvers’ ancestral home induces Charles to accept his brother Frederick’s plea for help with his work among fallen women and impoverished orphans in York. Charles soon finds himself struggling to identify a ruthless murderer while Antonia helps feed the women and children living in the asylum Frederick runs. The trial of notorious poisoner William Dove leads to surprising discoveries and sets legal precedent still followed today. A Tincture of Murder is a very cute and interesting mystery. It takes place in England during the mid 1800’s. Though this is the first Lord Danvers mystery I have read, I did not feel that I was missing too much by hopping in on the fourth book. I appreciated the characters and the mystery. Frederick, Lord Danvers brother, is a reverend in the very poor section of London. He set up a house to help pregnant women of ill repute. The women start dying, and Freddie believes foul play is involved. Since Lord Danvers has the reputation of an amateur detective, Freddie begs him to come help him find the perpetrator of these crimes. 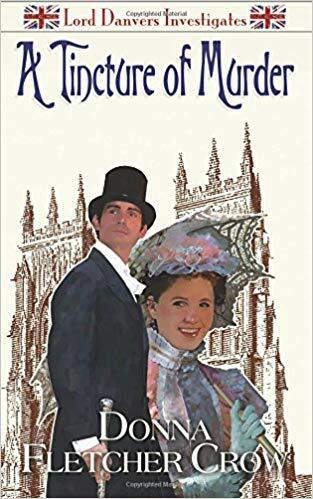 Due to circumstances beyond control, Lord and Lady Danvers travel to London to help Freddie in spite of the fact that Lord Danvers would rather not go. He thinks Freddie has gotten himself in trouble with a woman. Little do they know, that they will not only help solve the murders, but also help improve the conditions of the women they are helping. I loved the charitable work that was described in this book. You can tell that Ms. Crow has a heart for helping those in need, due to all the focus she put on that in this book. The historical aspect of this book was very interesting. I enjoyed seeing the case of William Dove played out. His was one of the first in which insanity was used as an actual cause for his murdering his wife. And the case of the children’s home was certainly more disturbing when I found out that it actually happened. I’d like to thank Donna Fletcher Crow for allowing me to receive a review copy of A Tincture of Murder! I enjoyed reading it very much. Donna Fletcher Crow is the author of 35 books, mostly novels dealing with British history. Christy, thank you so much for reviewing A TINCTURE OF MURDER. I’m delighted that you enjoyed it! And I love the opportunity to meet your readers here at your Cozy Corner. That actually sounds pretty fascinating! I like the timeline setting of the book too.